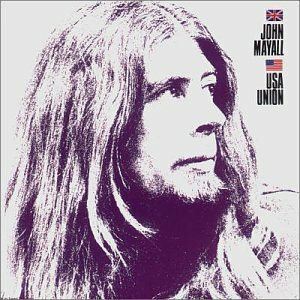 I have to say right off that I’ve neglected John Mayall. Shunned him, forgotten about him, flicked past his discs, undervalued him. I’ve taken him for granted. Yet Mayall was as much a part of my discovery of blues music as, say, Howling Wolf, Muddy Waters or Alexis Korner. I need to take stock. I saw the Bluesbreakers play often in the London of the mid-sixties. In their first incarnation they’d struggled to get a foothold. I didn’t think that John was much of a frontman. But with the arrival of Eric Clapton in 1965, things changed for the better. The Bluesbreakers album was hugely successful and is now considered a classic. In those days, line-ups were fluid, to say the least – and between 1965 and early 1967, Clapton and Peter Green job-shared with the Bluesbreakers. Green was on hand to record A Hard Road, another acknowledged classic. But by May, 1967, both men had left – Clapton to form Cream and Green to start up Fleetwood Mac. The vacancy was filled by 18-year-old (soon to be very , very famous) Mick Taylor. And it’s Taylor who plays lead on Crusade. John McVie (probably flitting between the Mac and Mayall) is on bass, Keef Hartley on drums, Chris Mercer and Rip Kant on tenor and baritone respectively. Mayall plays everything else and does the vocals. The album, recorded in 2 days in July, 1967 at Decca studios, is a cracker. The original mono album has 12 tracks, some of them penned by Mayall, some of them covers. All of the material is strong and repays repeated listening. In particular, Mayall’s The Death of J B Lenoir stays in the mind. Its haunting piano line and Mayall’s impassioned vocal, as he mourns his hero, creates a fitting elegy to a great bluesman. What the album does, is allow Mayall to stretch out, show his range and enjoy himself. Everything from jazz-tinged or funk-driven through to 12 bar straight ahead Chicago is here. It really is a tremendous listen. So – there it is. I should have listened harder the first time around. But I’m making up for it this time around. John is approaching 80 and he’s still touring – still playing the blues. There is an expanded version of this album available on CD. It contains a further 10 tracks from the 1969 compilation Thru the Years. I believe that Hughie Flint plays drums on some of these tracks. 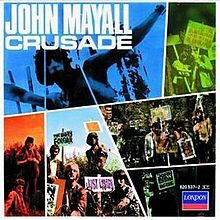 This entry was posted in Music and tagged Crusade, John Mayall. Bookmark the permalink.